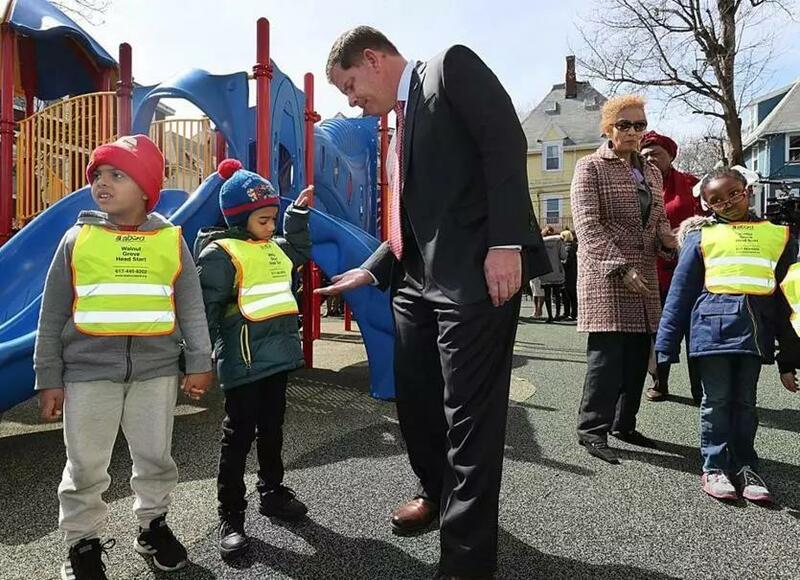 Mayor Marty Walsh greeted students at Walnut Grove Head Startt in April after he announced a $15 million investment to fully fund preschool in Boston. It was a 2013 campaign pledge from Marty Walsh that, if voters picked him, every 4-year-old in Boston would have the right to go to a high-quality preschool. Under a budget proposal submitted last week, Walsh is making good on that promise, with a $15 million infusion to fund the remaining 750 seats needed to reach full coverage. That means by 2025 Boston will be able to offer preschool to about 4,000 4-year-olds. It is an achievement that is worth noting, given that with education dollars spread thin, universal pre-K has been elusive goal for many cities. The burden instead has fallen on families to pay their own way, creating an uneven educational system of haves and have-nots even before kids start kindergarten. Studies have shown that kids in preschool programs have a higher chance of graduating from high school, obtaining a college degree, and getting a job. Boston’s journey — some two decades in the making — offers a road map of how other cities in Massachusetts can achieve preschool for all. Boston will have done so with a combination of public school classrooms and community-based centers with funding from the city, state, federal government, and even foundations. That’s perhaps the biggest lesson learned. Boston didn’t just open its own preschools, though most 4-year-olds attend one at a public school. To expand, Boston Public Schools partnered with organizations with preschool programs like the Boys & Girls Clubs and the YMCA to help raise their standards to what is being offered in the public schools. Boston also recognized the need to stem the high turnover among preschool teachers — an average of 30 percent — because of low pay of about $35,000. Boston is building the pipeline by making sure teachers are properly trained and compensated, with starting annual salaries in line with a BPS teacher of about $53,000. Even before Walsh’s election, Boston was a leader in early education in Massachusetts, but he has struggled to find the last chunk of funding. One time he floated the idea of selling City Hall, and later on he called on Beacon Hill to tap surplus money from tourism tax revenue. “We couldn’t wait any longer, we had to do this,” Walsh said recently. So what about the rest of the state? Only about a quarter of preschool age children in Massachusetts have publicly financed early education and care, according to advocacy group Strategies for Children. The state has helped fund efforts like Boston’s and is planning to continue to do so. House Speaker Robert DeLeo’s budget proposal for the third year in a row calls for a $20 million increase to boost the pay of early educators. Boston has led the way on universal pre-K, and now it’s time for other cities in the Commonwealth to follow suit. It will take a village: a variety of funding mechanisms and the willingness to experiment.